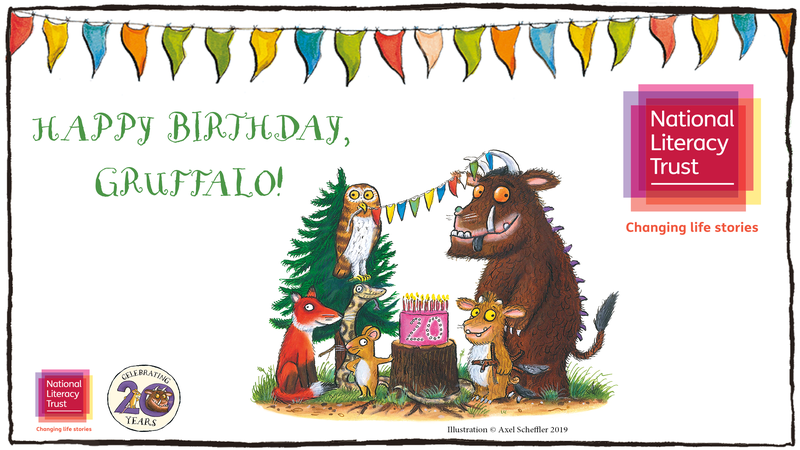 To celebrate The Gruffalo's 20th anniversary, we're asking children aged 5 - 11 to write the story of what happened next to their favourite character from The Gruffalo. What supporting activities are available? A printed poster and bookmarks, sent to you to display and give to your pupils taking part in the competition. The first 100 schools to register will receive a copy of The Gruffalo play script. The winning pupil will win a signed copy of the The Gruffalo and a Gruffalo hamper. The winning school will win £250 worth of Pan Macmillan books whilst each of the 20 runners up will win a signed copy of The Gruffalo. The Gruffalo himself will present the winner with his prize! This competition is open to and completely free for all UK schools. Entries are invited from pupils aged 5 to 11 (Key Stage 1 and 2). To enter the competition, you need to be a member of the National Literacy Trust, whether that is through a paid membership or a free basic membership. Find out more about the benefits of becoming a member. Download the Gruffalo competition entry form for more information about submitting your pupils' entries. Register your interest in the competition by filling out the form below and we'll send you a poster, set of bookmarks and timely reminders about submitting your entries. The competition opens on 1 April and closes on 30 June.